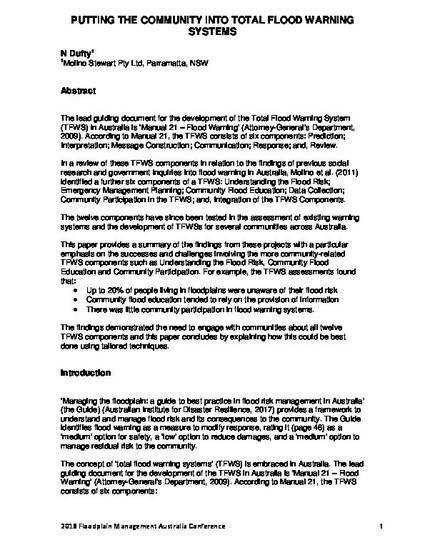 The lead guiding document for the development of the Total Flood Warning System (TFWS) in Australia is ‘Manual 21 – Flood Warning’ (Attorney-General’s Department, 2009). According to Manual 21, the TFWS consists of six components: Prediction; Interpretation; Message Construction; Communication; Response; and, Review. In a review of these TFWS components in relation to the findings of previous social research and government inquiries into flood warning in Australia, Molino et al. (2011) identified a further six components of a TFWS: Understanding the Flood Risk; Emergency Management Planning; Community Flood Education; Data Collection; Community Participation in the TFWS; and, Integration of the TFWS Components. The twelve components have since been tested in the assessment of existing warning systems and the development of TFWSs for several communities across Australia. There was little community participation in flood warning systems. The findings demonstrated the need to engage with communities about all twelve TFWS components and this paper concludes by explaining how this could be best done using tailored techniques.